Problem: A street rod owner complains that coolant is leaking from the side of the cylinder block. The engine was recently overhauled and the coolant has been leaking since the engine was rebuilt. What could be the problem? Solution: Cylinder block core plugs, as shown in the photo, should be replaced during an overhaul. Sometimes, when new core plugs are installed, they are not inserted correctly. If they are inserted at a slight angle, they may leak engine coolant. Also, a sealant should be used during installation. To solve the problem, the leaky core plug should be removed and replaced correctly, using a recommended sealant and installation tool. The illustration to the left shows a core plug installed correctly in a cylinder block. Note the location of the sealant. When installed correctly the core plug is pressed evenly into the cylinder block casting. The domed part of the plug should face inward or to the inside of the block. Concerning sealants, some technicians say a sealant is not necessary. 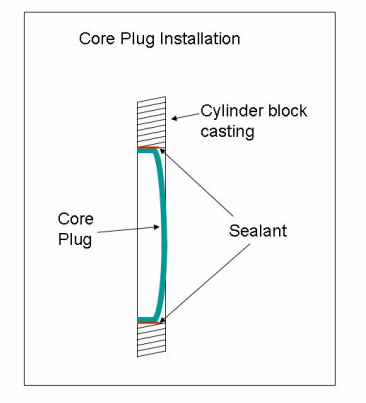 However, if there is any corrosion where the core plug seals to the block, leakage may occur without a sealant. There are many types of anaerobic (free of oxygen) sealants available on the market. Check with you local parts store to purchase the correct sealant.